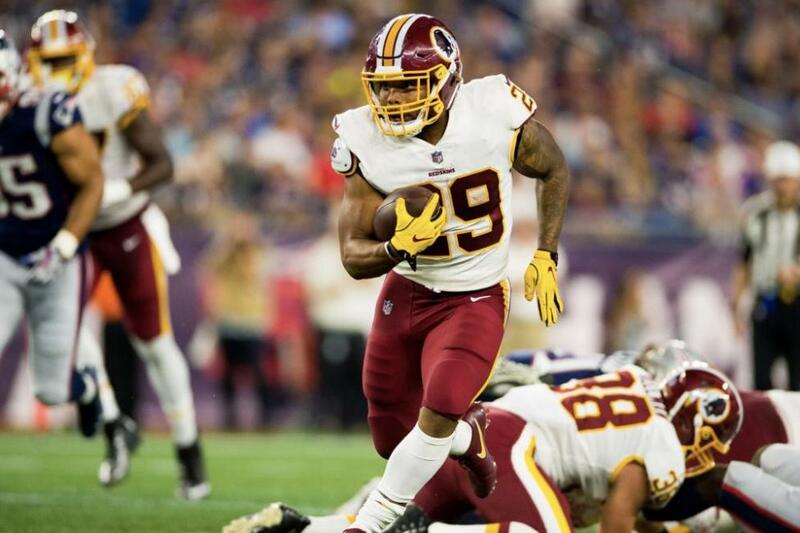 The Washington Redskins signed three free agents and placed rookie running back Derrius Guice on injured reserve Saturday in a series of roster moves. Washington announced the signings of tight end J.P. Holtz, linebacker Jeff Knox and defensive lineman Jalen Wilkerson. The team also waived/injured fullback Elijah Wellman. Guice landed on injured reserve along with tight end Manasseh Garner. Guice was a second round pick in the 2018 NFL Draft. The rookie running back suffered a torn ACL in the Redskins' preseason opener against the New England Patriots on Thursday at Gillette Stadium in Foxborough, Mass. "Well we are obviously very upset for Derrius," Redskins coach Jay Gruden told reporters Saturday. "You know, he's put a lot of work in and had a very promising rookie season ahead of him, but unfortunately these injuries happen. He's a great kid, he's going to work hard, he'll recover and - so there's no problem there. You know, we are disappointed for Derrius." [post_ads]"You know we had high hopes for him and what he could do for this football team and what he would accomplish in his rookie year as a person and all that good stuff. But I know that knowing him and knowing the doctors we have and the rehab that we are going to give him, provide for him, he will be 100 percent in no time." The Redskins now have Chris Thompson listed as their starting running back with Rob Kelley and Kapri Bibbs listed as the second string backs. Washington also has Samaje Perine and Byron Marshall as backups on its unofficial depth chart. Holtz, 24, entered the NFL as an undrafted free agent signing in 2016 by the Cleveland Browns. He has spent the last two seasons on and off of the Browns' practice squad and has yet to make an NFL appearance. Knox, 26, spent time with the Tampa Bay Buccaneers in the last two seasons. Wilkerson played for three seasons at Florida State. Gruden said he thought that the Redskins were "pretty good at the running back spot" when asked if the team would sign a player at the position. The Redskins battle the New York Jets in another preseason game at 8 a.m. Thursday at FedExField in Landover, Md.